Today in our series on tire information we will look at some more important information contained in the fine print on the side of your tires. 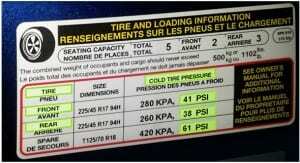 Every tire has a rated maximum inflation pressure. Often it will be found in small print around the rim edge of the sidewall. It will say something like “Max. Load 670 kg (1477 lbs.) Max. Press. 340 kPa ( 50 PSI)”. This means that the tire will safely carry up to 1477 lbs. and can be safely inflated up to 300 kPa (Kilopascal) or 50 psi (pounds per square inch). Often the vehicle manufacturer will specify a slightly lower pressure on the door jamb sticker for purposes of ride comfort and handling performance. For maximum tread life and fuel economy it can sometimes be helpful to inflate the tires to a pressure closer to the rating on the tire rather than the rating on the door jamb of the car, but doing this can sometimes negatively affect ride comfort and possibly traction. Every tire sold in the US must have a DOT (Department of Transportation) number. The DOT number is a safety certification number that includes information about who manufactured the tire and where and when (week and year) the tire was manufactured. This number is useful if a recall needs to be made on a certain batch tires. For potential recall or safety issues it is a good idea to register your tires with the manufacturer. You can do this online or by sending in a DOT registration card (provided by your tire installer). One other marking on some tires, is a directional marking. Some tires are designed with a certain side of the tire intended to be mounted towards the inside or outside of the vehicle. These tires will have either an “Inside” or “Outside” written on the tire and should be mounted accordingly. Other tires are designed to provide good traction and treadwear only if operated in a certain direction. These tires are called directional tires and have an arrow symbol or other marking on the outer sidewall of the tire indicating which direction the tire should be mounted for forward rotation. Well, there you have it. That covers the information found on most tires sold for passenger vehicles in the US. Now you can be an educated consumer and impress your friends with your knowledge of tires. If you are located in the Harrisonburg Virginia area – give us a call and we will be glad to help you choose the right tires for your car or light truck. It isn’t just size that matters when choosing tires for your vehicle. There are some other numbers and letters on the side of the tire that you should pay attention to. 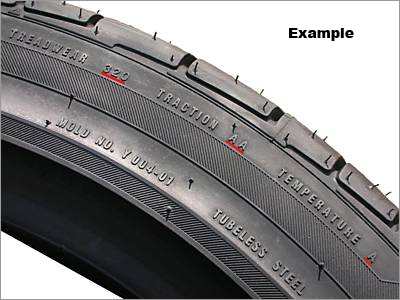 You will find the treadwear listed in three digit numeric format such as “320” and the traction and temperature in letters such as AA, A, B, or C.
The treadwear rating is a relative measurement of the tire’s durability and tread life. It is important to remember that road surfaces, driving habits, and other factors determine actual tread life. Each tire manufacturer independently determines treadwear through their own tests. Treadwear is not based on any one industry or government standard. The higher the number the longer the tire should last compared to similar tires from the same manufacture with lower numbers. A tire with a treadwear rating of 800 should theoretically last about twice as long as a tire with a treadwear rating of 400. A longer life tire will be designed with a harder rubber compound to withstand wear better. Unfortunately, while a harder compound tire will last longer it will do so at the expense of some traction – particularly on wet surfaces. The softer tire compounds will grip the road surface better for improved handling and braking performance. The traction specification is listed beside the treadwear in the form of letters such as AA, or A, or B with AA being the highest grade possible. The traction rating is a measurement of a tire’s ability to stop on a straight, wet surface under controlled conditions. It does not indicate the tire’s cornering ability on a wet surface or its traction on ice or snow. The temperature rating is a measurement of a tire’s resistance to heat generation under normal operating conditions at recommended inflation pressures. Temperature grades range from A to C, with A being highest rated and therefore most resistant to heat generation. Tires graded A effectively dissipate heat up to a maximum speed that is greater than 115 mph. B rates at a maximum between 100 mph and 115 mph. C rates at a maximum of between 85 mph to 100 mph. Tires that cannot grade up to C or higher cannot be sold in the US. For safe performance and good tire life it is very important that the tires you put on your vehicle are the right size. On a label found on the door jamb of your car you can check to see what size tires your vehicle was designed to use and on this label you will find some numbers that look like this 225/45 R17. 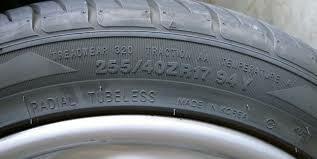 You will also find these numbers on the sidewall of your tires. The size of the tire is really pretty simple to decipher. The first number – in this case the 225, is the width of the tread of the tire given in millimeters. 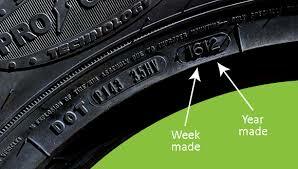 The second number describes the height of the sidewall (the part of the tire from the rim of the wheel to the tread). This is expressed as a percentage or ratio of the tread width referred to as the aspect ratio. In this case it is 45 which means that the sidewall height is 45% of 225 millimeters or about 101 millimeters. The last number is the diameter of the wheel or rim expressed in inches – in this case a 17 inch wheel. (I know, I know, it doesn’t make any sense to mix English and metric measurements). The “R” stands for radial construction. A bias ply tire will not have any letter in front of the rim size. Almost all passenger and light truck tires sold today are radial tires. Sometimes you will find a “P” or “LT” in front of the size. This designates what kind of use the tires are intended for. “P” stands for passenger tire and “LT” stands for light truck tire. Sometimes you will see a ZR instead of an R. The “Z” designates the speed rating of the tire. Speed ratings will be explained next. It isn’t just the size of the tire that is important. Load ratings and speed ratings are also very important for safe driving and good tread life. Again the manufactures recommendation will be found on the door jamb sticker and somewhere on the side of the tire you will see numbers and letters in this format “94H”. The numbers represent the load rating of the tire. Generally the higher the number the more weight the tire is designed to carry. In this case the “94” indicates the tire is designed to carry up to 1477 lbs. at a normal inflation pressure. “H” means that this tire is rated for speeds up to 130 mph. Light truck tires have a different weight rating classification system with letters such as B,C,D,E which correspond to a ply rating. “C” stands for 6 ply tires, “D” for 8 ply, and “E” for 10 ply. These different ratings indicate the relative strength of the tire and maximum inflation pressures the tire can safely handle. If you are located in the Harrisonburg Virginia area – give us a call and we will help you choose the right tires for your car or light truck. Usually the most prominent markings on a tire are the name brand and model. Tire manufacturers such as Michelin, Cooper, Firestone, B.F. Goodrich, want to make sure their name is featured prominently on the tire. These companies also make a variety of tire models. 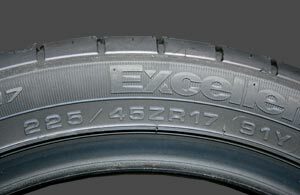 The tire model identification sometimes gives an indication of the intended use or special features of the tire. For example a Cooper Discoverer AT3 tire is an all terrain (AT) truck tire intended for vehicles that might need to venture off the pavement. A Cooper Discoverer H/T tire has a tread pattern that is better suited to highway driving. A Michelin LTX M/S tire is a Light Truck tire intended for all season use with better than average traction in mud and snow. A tire like the Goodyear Fuel Max Assurance is a tire which has been designed for low rolling resistance (LRR) to facilitate better fuel economy. People who live in areas that receive frozen precipitation in the winter should also take special note of the seasonal designation of tires. All purpose or all season tires with good snow traction will often carry an M/S or M+S designation. These tires are suitable for use year round and have above average snow and mud traction. 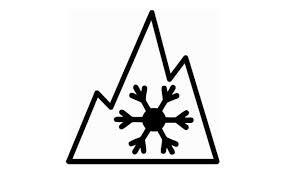 Purpose built winter only snow tires will generally have a mountain peak outline symbol with a snowflake inside. These tires offer more extreme snow and ice traction and are generally not well suited for summer use. Sometimes these tires are made to accept studs which are small metal spikes mounted into the tread. Tires with an M+S A/S or AS designation in their model or elsewhere on the tire are considered all season tires. These tires are a compromise between good hot/dry weather performance and snowy/wet weather performance. These tires will generally offer acceptable traction in minor wet and winter conditions as well as dry pavement but they are not true winter or snow tires. 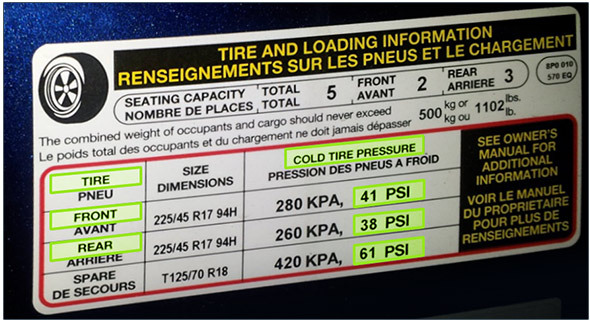 If none of the above listed designations are on the tire or in the marketing literature then it is considered to be a summer or performance tire and should not be considered safe for slippery conditions in ice or snow but these tire will handle better on dry roads and in high temperature environments. What do you know about the tires on your car? The automobile tire is possibly the least understood part of a modern vehicle. With all the technology that is employed in today’s vehicles, the tire is, and continues to be, the one component that few people truly understand. It is often overlooked and dismissed as a simple device. This is simply not the case. But unfortunately even people in both the retail tire industry and the automotive repair business often have very little knowledge of tires. Have you ever wondered what all those little numbers on the sides of your car tires mean? If you are like most people you have probably never given it a thought. When it comes time to buy new tires you just tell the friendly salesperson at the tire shop to put on something cheap or something good. Most people care about the safety of their passengers and cargo and most people want a tire to wear properly so they don’t have to replace them often. But do you know whether you are getting something good or whether or not the cheap tires are actually the right tires for your car and driving conditions? All those little numbers on the side of your tires can tell you whether the tires you are buying are the right tires for your vehicle and driving style. But most of you probably don’t know what all those little numbers mean. Don’t worry, Mountain Valley Motors is here to help. Not only do we know what all those numbers mean, we will be glad to explain them to you so that you know exactly what you are getting. So let’s get started on a little tutorial shall we? Over the next couple days we will post a series of informational articles to explain what you need to know in order to be an educated consumer.